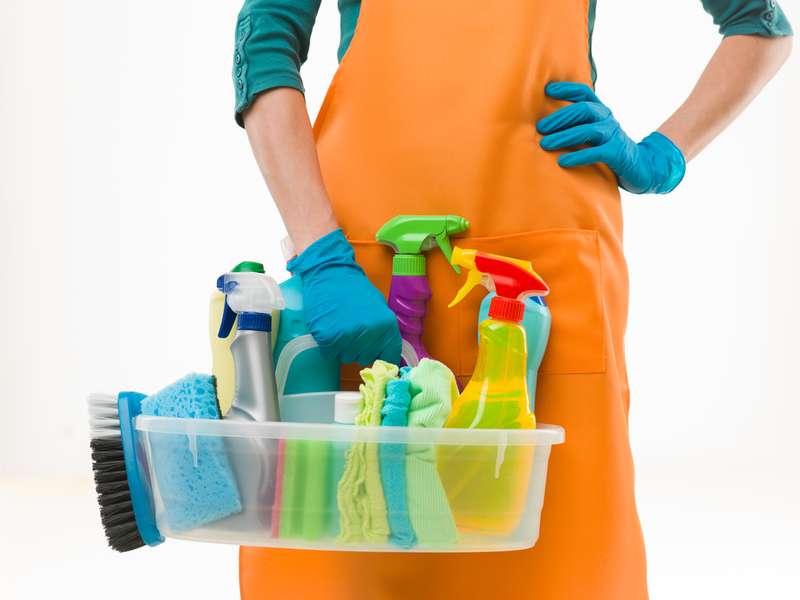 No-one really enjoys cleaning, but once it’s done, there’s nothing more satisfying than having a squeaky-clean home. It’s even more important if you’re selling a property to make sure it looks its best. So we’ve looked at some of the best products out there to help you save time and achieve great results. We were a little skeptical when this arrived in the office. Our main concern was that it would be one of those things that seemed like a great idea, but ended up gathering dust. How wrong could we be? I’ve always fought a losing battle when cleaning windows, leaving a smear somewhere no matter how hard I try. Not any more – this awesome piece of kit leaves windows gleaming. Once we’d cleaned all the windows, we tried it on mirrors, tiled walls and anything with a glass surface. It comes with a small spray bottle into which you put water and some of the cleaning fluid provided. A handy cloth-type arm attaches onto this and you spray the window and then give it a clean with the cloth. Then, the magic happens. Turn on the window vac and it squeegees away the dirty water into a container in the handle, leaving crystal clear windows. We’d heard a lot about the Gtech cordless vacuum sweepers and, with a houseful of animals, we were even more excited about trying out the new K9. The K9 has been designed to deal with stubborn pet hair and, having tried it out we were not disappointed. The first thing you have to do is unpack and assemble the AirRam. It couldn’t be simpler – just two clicks and you’ve got your handle in situ and your battery pack in place. Then all you have to do is charge it for a few hours and you’re ready to go. One of the best things about the K9 is the fact that teenagers think its cool and ours actually wanted to try it out in their bedrooms; and the K9 dealt with this almighty challenge with ease. What’s more, it comes with replaceable fragrance sachets so you can combat unpleasant odours from pets and kids alike as it engulfs eons of dust. Another thing we loved about it was the freedom of using a cordless vacuum. I’ve always managed to get the cord of my hoover stuck under a door or wound around someone’s leg. The K9 was absolute bliss in comparison. It’s also very lightweight and much easier to take up and downstairs than a conventional vacuum; ideal for anyone with back issues, the elderly or pregnant women. The flexibility of movement makes it a doddle to use, cornering without knocking great chunks out of furniture. You can also say goodbye to dust bags. The K9 is bag-less and you simply empty it into the bin when it’s full. As for the actual cleaning part, it gave the best results of any vacuum we’ve tried to date. It also gave the carpet a new lease of life. One thing to note is that is doesn’t come with any attachments or nozzles. So, if you want to hoover the stairs or under cupboards, you’re going to need to buy the Gtech Multi which has been designed for these sorts of jobs. The Gtech AirRam K9 costs £249.99 – to buy or to find out more, head along to Gtech. Anything that comes in an old-fashioned tin is always good. There’s a lovely traditional meets contemporary feel to the Mangle & Wringer range, which means you wouldn’t feel embarrassed if someone had a bit of a nosey around your cleaning cupboards. We tried the Bathroom Balm, which brought up all the chrome fittings a treat. The products are made in the UK and are all-natural and bio-degradable too. What we really liked is the fact it is fragrance free but does a great job. The Bathroom Balm costs £5.80 and is available from Mangle and Wringer. British-owned company Astonish makes a comprehensive range of cleaners. Our favorite was the Oven & Cookware cleaner which worked really well on everything from Agas through to glass ceramic stoves. It comes in a cute little tub and has a clean lemony smell to it, which doesn’t smell the least chemically. Their products are also endorsed by The Vegan Society and Cruelty Free International – impressive for a range that covers everything from laundry detergent through to car cleaning products. Discover the complete range and where to buy at Astonish. We found this being stocked by Beauty Naturals and we loved it. It truly puts the spring into spring cleaning with it’s fresh, clean smell and really cheers you up whilst you’re cleaning thanks to the essential oils it contains. It doesn’t really look like a cleaning product and it’s another one of those products you’d rather keep on show. It works well too as an all-round spritzer to niftily give everything a quick facelift. Maison Belle Cucumber Cleaner costs £5.40 from Beauty Naturals. They also sell other great all-natural cleaning brands. Dettol disinfectant was always on hand at home when I was growing up for childhood cuts and grazes. The brand has come a long way since then and now produces a host of cleaning products. If you want to give your house a good all-round cleaning and get rid of bacteria at the same time, Dettol Power & fresh Advance is the product for you. It comes in four types, but our favorite with the Refreshing Green Apple as the fragrance was not too over-powering and it smelt like the place was nice and clean after we’d used them. We found it especially great for cleaning up after messy kids and toddlers throughout the day. It costs around £2.10 and can be bought from most good supermarkets. These products have a lovely old-fashioned feel to them and they all work really well. The smell takes me back to childhood with a distinct aroma of Ajax. We tried the Stain Remover, Power Spray and Power Cream throughout the house and they are particularly good at getting rid of stubborn stains and marks. We loved the way these products made the chrome sparkle and the house definitely felt like it had been spring cleaned. The Barkeeper’s Friend bundle can be found at Original Bar Keepers.